From improving eyesight to stimulating digestion, boosting the immune system and promoting skin health; the list of benefits is extremely generous. Passion fruit is believed to help alleviate the symptoms of osteoporosis and even improve respiratory conditions, such as asthma. The super-fruit also boasts cancer-preventing properties and is an excellent source of vitamins, especially vitamin C and A. It’s also very high in fibre - so great for digestion. The fleshy interior also contains crunchy, edible, fiber-rich seeds. Three passion fruits contain only 54 calories and supply your body with 189 milligrams of potassium, and 27 percent of the recommended daily allowance of vitamin C.
Originating in the warmer regions of the globe, such as Brazil, Paraguay and northern Argentina (where frost is never present), passion fruit’s fresh and exotic flavor can be enjoyed in juices, breakfast, snacks, desserts and salads. Craving a taste of this superfood in your diet? This creative recipe by Stacey from www.goodnessis.com provides the best flavours and benefits of this wonder fruit. Despite the strange outside appearance of a passion fruit, inside is a sweetly sensuous, golden flesh full of small black edible seeds. The flavour is aromatic strong, tangy and almost punchy. When buying passion fruit, ripe fruit should be firm and heavy with wrinkled skins, and have a little “give”. If the skin is not deeply wrinkled, but only shriveled and unappealing, keep the fruit at room temperature until it is. Elixir : a substance, usually a liquid, with a magical power to cure, improve, or preserve something. Turmeric root is often used in Ayurvedic medicine for its antibacterial, anti - inflammatory, antioxidant, and antiseptic properties. For this elixir, it is combined with the multiple benefits of passionfruit, honey and ginger - all healing and preventive powerhouses on their own. A great way to start the morning, this Elixir works as a wonderful topping for your morning yogurt or warm cooked oats. At other times, it´s good drizzled over vanilla ice-cream for an evening treat, as a drink (stirred into hot, not boiling, water or gently heated and stirred into milk) or added to smoothies or juices for a flavour kick. Grate the ginger, and lemon zest, halve the passion fruit, and scoop out the pulp and seeds to measure half a cup. Set aside. Pour the honey into a jar, add the passion fruit pulp, grated ginger, turmeric, lemon zest and ground pepper. Stir to combine well, allow it to stand for 30 minutes before using or an hour if you can, cover and refrigerate. The longer it sits the more the flavours balance and settle. Stir before serving. Use within 1 week. When ready to serve, divide the yogurt into two individual bowls, and evenly spoon over the chia pudding. 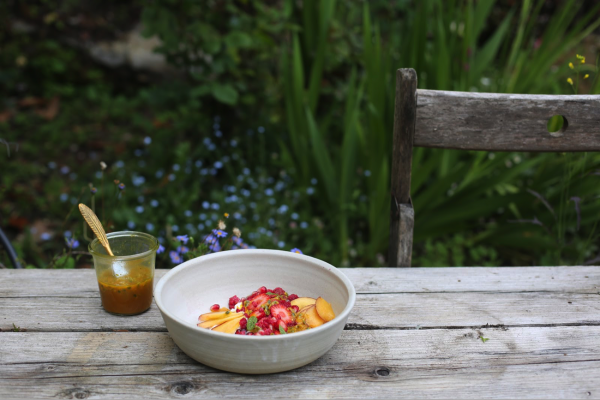 Drizzle the Golden Passion fruit Elixir over the top, arrange the fruits & berries, and garnish with fresh mint leaves, toasted almonds or your favourite granola.